Nagging questions raced through my mind. We live in a tiny apartment; how can a dog be happy here? Where will he or she go potty? How much time will this take up? I had so many questions and concerns, because an animal is a huge responsibility, even if the puppy isn’t mine. Despite my inner turmoil, we received Pebbles the puppy. Upon arrival, Pebbles was four months old. She was a petite four-pound mix of Shih Tzu and Maltese. Boy was she adorable. She was the most lovable puppy I’d ever seen, but isn’t that what all new aunts say? Like any young child who had never had a dog, I was intrigued by this new addition to the family. 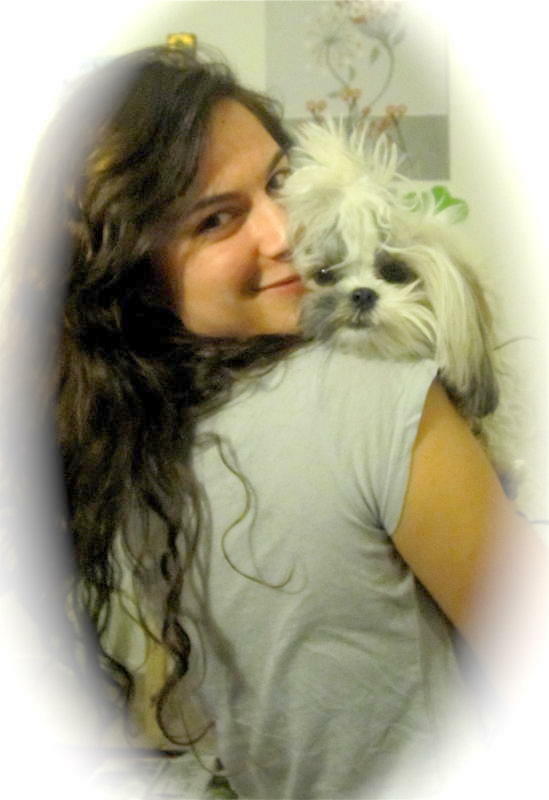 Though Pebbles was my roommate’s dog, we still lived in our small home and I was hesitant to share it at first. Slowly, my doubts faded into nothingness. I couldn’t resist the utter cuteness of Pebbles. She was so little and fluffy. Her hair was long and shaggy. She was mostly white with patches of tan and one black streak of fur near her cheek. Her pink belly was covered in spots and her small underbite was endearing. As a puppy, her energy never ceased. She always wanted to play with a stuffed animal, a shoe, a cord, a ribbon, and if there was nothing else, your hand. After spending the past year with her, the puppy in Pebbles is ever-present. Her lust for life never ceases. I want to be like this. Every step Pebbles takes with her tiny paws is looked at with an innocence unknown to humans. Pebbles has a way of looking at you. It makes your heart melt and your love of all earth’s fuzzy creatures grow fonder. When you call her name, she looks up and tilts her head, as if saying, “I am interested in what you have to say, but it better be good because I was really enjoying chewing on this bone.” It is impossible to dislike this little critter. Pebbles may have been a present for my roommate, but she truly is a gift to me. She is so tiny; the small apartment is like a vast wonderland of adventure for Pebbles. There are a million places for her to hide. Pebbles likes to sprawl out in the middle of the floor, waiting for me to trip over her, which I do at least 20 times a day. She likes to nestle between the legs of my office chair and enjoys making a den out of the living room table, hiding her treats and toys underneath. Without that small pup in the apartment, my life would be colorless. Pebbles is a ray of sunshine on a cloudy day; she brings me light. When I am overwhelmed with work and school, seeing her happy face makes me chipper. Regardless if I am sad, she is not. She tries to help in whatever way she can. It’s amazing the senses a dog has. Maybe it’s my step or my jingling keys, but Pebbles knows when I’m about to come to the door. She greets me every time I walk in and she does so with the warmest hello, which I have never received from a human. January 2011 marks the one year anniversary of when Pebbles moved in. Pebbles is the kindest, sweetest, most nurturing and loving roommate I have ever had. I don’t want there to be a time when she is out of my life. I don’t want there to be a time when she isn’t here. Though she does not belong to me, she will always have a very special place in my heart. I am a more well-rounded being because of Pebbles. Her naivety opened my eyes to the sweetness of the everyday. Everything that happens is a new adventure. Every human, leaf, or bug is a fresh piece of life to intake. Life if short and unique; sometimes you just don’t know what to expect. Life is beautiful and amazing with so many experiences to uncover. Life is precious, just like Pebbles. I was drawn to your story link because my dog’s name is Pebbles! My youngest, six at the time, named her. She knew my husband and I once had a border collie named Wilma (Yes, fans of the Flintstones). Unfortunately, Wilma was killed by a car after just two years of raising her. Pebbles is 1/2 border collie and 1/2 black lab. So, you can imagine, much bigger than your cute little Pebbles. Ours is a DIVA and beautiful in every way.